SAN FRANCISCO, CA, May 2, 2017 – InsurTech is a burgeoning phenomenon that is modernizing the insurance industry. It is disrupting the traditional value chain whereby insurers offer loss protection, and shifting the emphasis to risk mitigation. Incumbents face disintermediation as investors in search of higher yields pour money into insurance-linked instruments in the capital markets. And entrepreneurial businesses are targeting friction costs and inefficiencies within every aspect of the traditional value chain. Arguably, insurers who stick too long with the old model will fade as premiums and their balance sheets shrink. Those who thrive will learn to ride the wave of disruption to capture new opportunities – although whether they will still be known as insurance companies remains to be seen; they might have to reinvent themselves entirely. Many market participants want to embrace the InsurTech revolution but continue to struggle with determining how to successfully monetize industry changes, at least in the short term. Should they invest in their own research resources and fund development of new technologies inhouse or with partners outside of the insurance industry? Should they set up Venture Capital (VC) arms and build portfolios of promising start-ups with potential to change their core business or at least become successful financial investments? Or should they monitor the market looking for winning technologies that are already mature and pay up to incentivize owners to sell to a large incumbent corporation? A venture capitalist rule of thumb states that six out of 10 VC backed investments go out of business, three will be sold at a moderate profit or break even, and one will return handsomely in an IPO or acquisition. If we overlay these expectations with the remote probability that an underlying technology will be relevant to the sponsor of the corporate VC fund, we can see how challenging it is to win as a corporate backed VC. But there are several examples of successful incumbents that have recently formed corporate venture arms and are actively evaluating InsurTech investment and other opportunities. In this report, we analyze incumbent InsurTech strategy by examining the corporate venture and partnership model of Munich Re – one of the most active strategic investors in the space. The $100 billion small business insurance sector is one of the most promising for disruption, as insurers attempt to navigate the complexity of automating underwriting processes to accommodate a broad range of business classes in a user friendly format and combat the inefficiency of processing small ticket premiums and claims. While digital distribution platforms have achieved limited market penetration to date, industry research suggests that up to 25% of total small business insurance premium could be digitally underwritten by 2020 – a hypothesis supported by demographic trends and changing small business owner behaviors. Indeed, a number of independent platforms have successfully raised capital with the goal of accelerating small business insurance market disruption. We examine the characteristics of the small business insurance market that make it susceptible to digital disruption, review recent carrier activity in the space and speak with executives from recently formed independent platforms to gain insight into different business models of SME insurance disruption. Amidst significantly elevated InsurTech investment activity from insurers, Travelers’ £400 million acquisition of UK SME insurance broker Simply Business last month marked one of the largest investments to date, targeting the continued shift towards digital distribution in the small business insurance sector. InsurTech’s rise means that there are an inordinate number of new tools and technologies with the potential to optimize existing business processes. Which products add sufficient value to warrant investment? We look into the ‘hype cycle’ of the InsurTech revolution, from early overinflated expectations to the productive applications and innovations that survive. 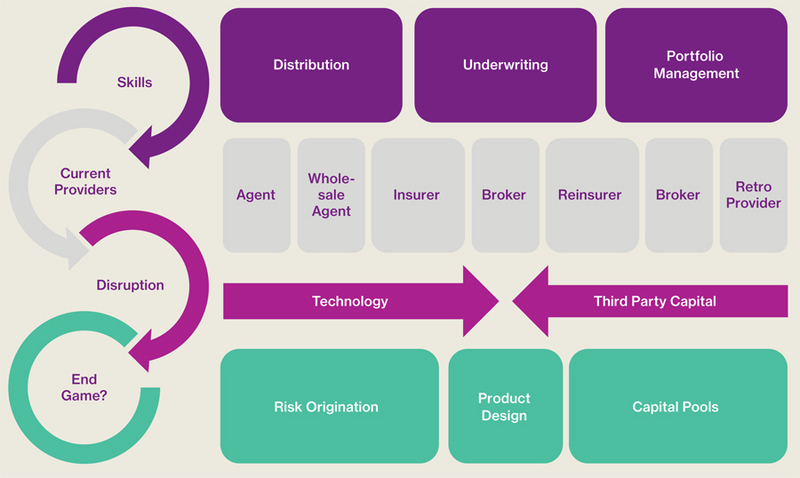 As part of Willis Towers Watson’s ongoing analysis of trends and business opportunities that are relevant to our clients, we hope you will find the Quarterly InsurTech Briefing useful. As ever, we welcome your feedback and suggestions.